City Coach Company vehicles in Laindon Station yard 1936. City Coach Company vehicle passing Laindon Recorder office in High Road, Laindon. KTW239 - City Coach Company vehicle in Laindon Station yard. City Coach Company vehicles in Laindon Station yard. 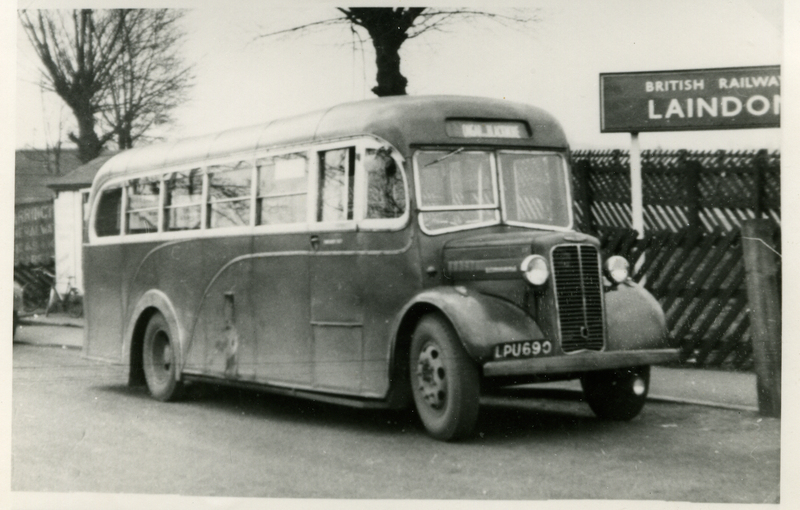 LPU690 - City Coach Company - vehicle in Laindon Station yard, going to Ongar via Blackmore. GPU434 - Eastern National vehicle in Laindon Station yard. KNO625 - Eastern National bus turning round in Church Road, Laindon. KNO625 - Eastern National bus waiting in Church Road, Laindon. 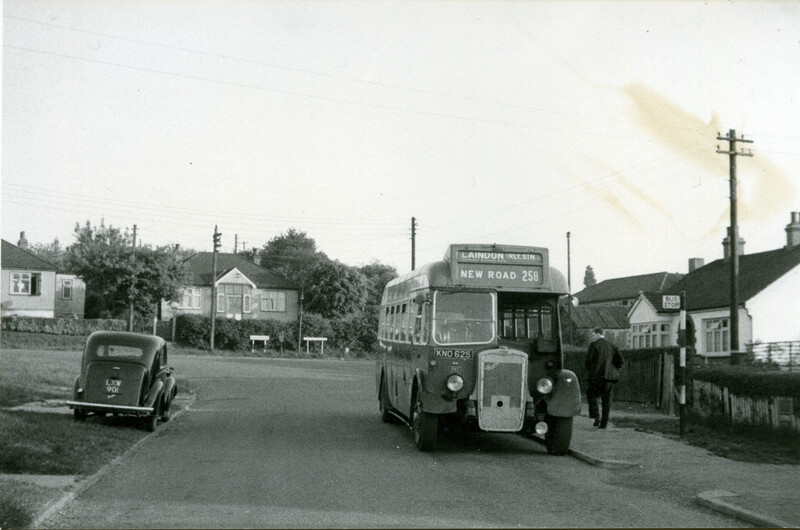 May 1959 - First day of operation of short journeys on service 258 from Church Road to Laindon Station via Arterial Road and High Road. JXN340 - Ex London bus operating for Thomas Wright, on works outing, pausing outside Grays Co-operative stores in Laindon High Road 1957. 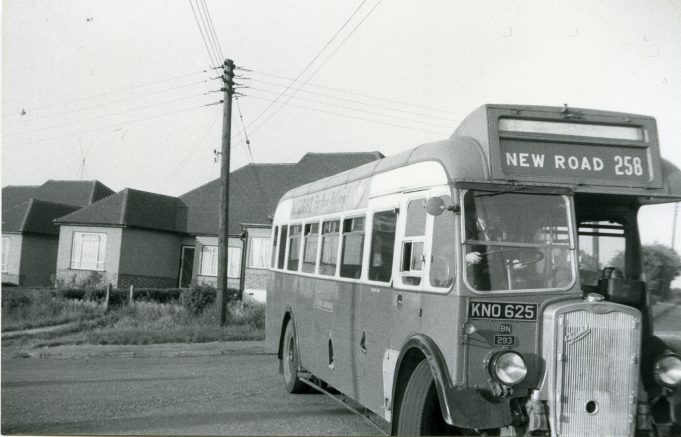 Eastern National bus on Service 254 to Laindon Station at Fortune-of-War roundabout - 1958. DJN554 - Eastern National bus on service 2a to Romford at Fortune-of-War bus stop. 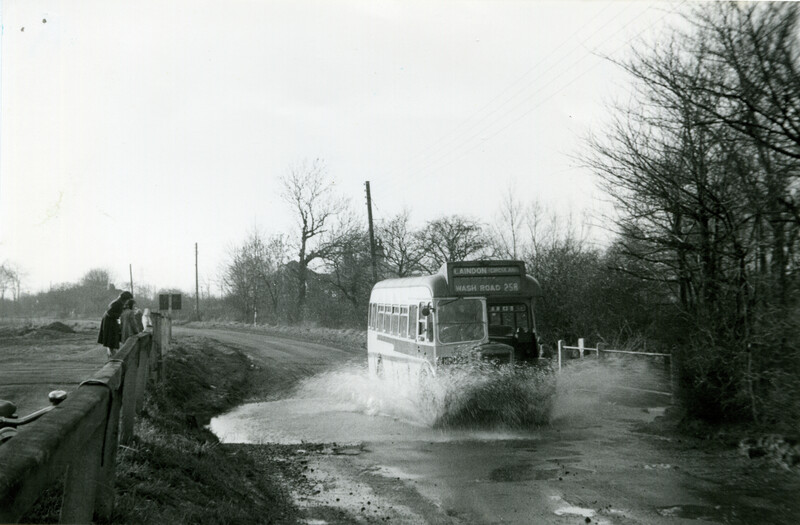 Eastern National bus on Service 258 splashing through the stream in Wash Road, Laindon (1959). Eastern National bus on service 15 (ex 2a) being the first vehicle to operate along Laindon Link and High Road, Laindon to Romford (June 1961). 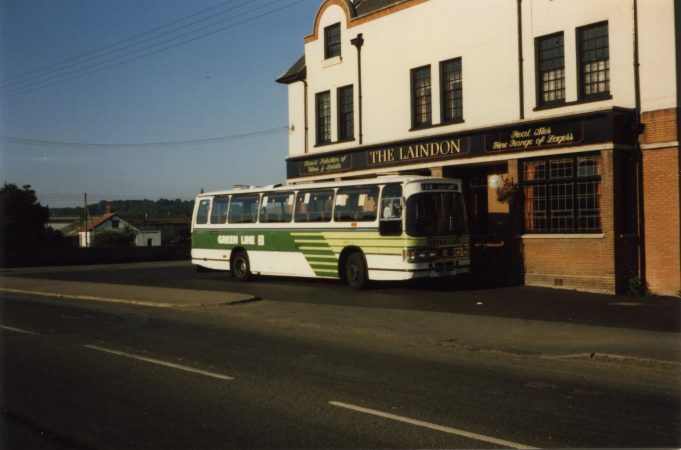 Green Line coach waiting outside Laindon Hotel (August 1986). Eastern National (Thamesway) bus on service 154 to Basildon Bus Station at Fortune-of-War roundabout (1991). 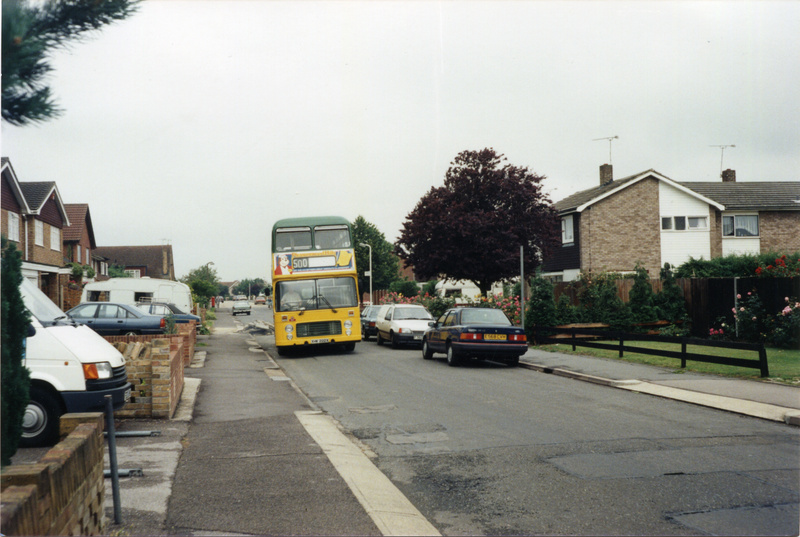 Eastern National service 500 in Worthing Road 1989 - short lived operation. 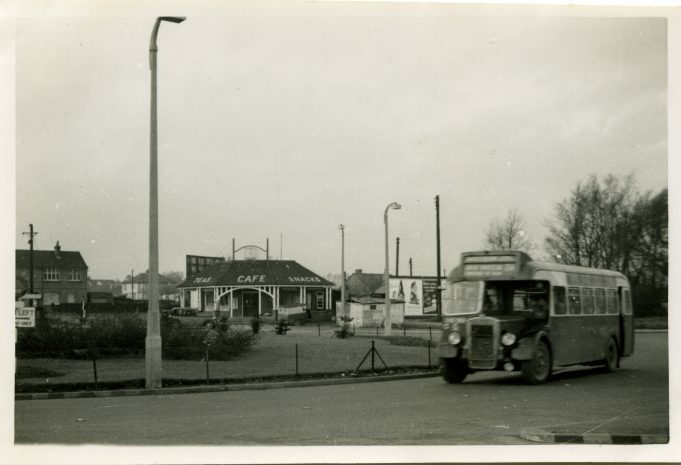 When Basildon New Town started being built in 1954 we used to take the 2A bus from Romford Market to Whitmore Way in Basildon to visit relations who had moved there from Walthamstow. Remember the return journey in the dark as most of the route was through the open countryside until you reached Hornchurch. Brilliant memories of those days before the car took over. I remember quite well the Eastern National service from Doesgate Lane, Bulphan, to Laindon Station, via Langdon Hills. Very steep, the old Bristol L only just made it. Later on in years it travelled along Lower Dunton Road, we, my mum and me, used to catch it at the Haystack, the King’s House at the bottom of Stack Avenue, where we lived with my Grandfather. It then crossed the very busy A127 at Wayletts garage then along to Dunton Road. In 1974, I became a bus driver for Eastern National. I often drove the 238 route to Doesgate Lane whereupon I turned around to return to the station. I enjoyed many a cuppa at Station Approach Cafe. It was my favourite route, as I knew many of the people who boarded my bus, I tended to run a little late as I always got chatting to them about the old days. Now 44 years on I’ve just retired from all those years of bus driving! Enjoyed every minute of it. A big thank you for showing these great photographs. 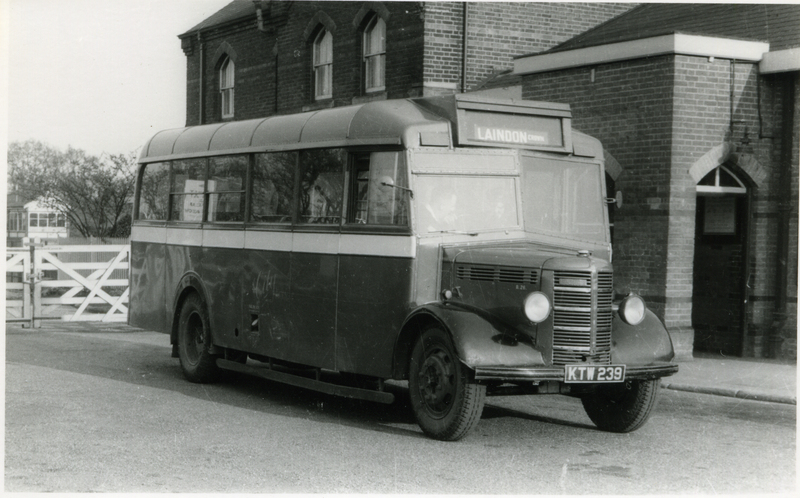 Really wonderful photos of the Laindon bus services. I recall the Eastern National service from Tilbury to Harwich, when I attended LHP school. To travel to Harwich in modern times, this is the route you will now have to take. Bus from Laindon, to Basildon Town Centre, change to the 100 service to Chelmsford, change to Colchester bus. Change at Colchester, for Clacton bus. Change at Clacton for the two hourly service to Harwich. So this is progress, eh!! To think that I can drive to Clacton from Laindon in a little over the hour. Those old Eastern National green and cream buses were real bone shakers, but no endless changing like today’s “modern” journey to Harwich! Some good memories sparked by these bus pictures. Laindon wouldn’t have been Laindon without those green and cream single decker Eastern National buses and coaches up and down the High Road. 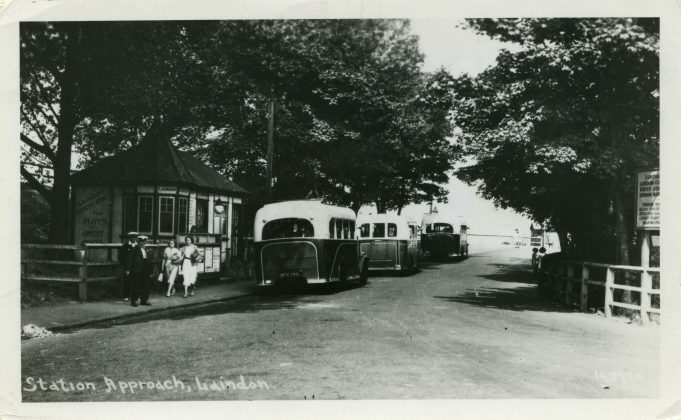 The stop at Church Road near Laindon Park School was where we used to head for at the end of the school day and where a faithful single decker would be waiting for us. My local bus stop was near The Variety Stores in the High Road. Our bus would head off in the morning for the Arterial Road A127 and either drive straight up in the Church Road direction or would go via the Old Fortune of War and through Wash Road. Sometimes we would go through the wash itself, sending spray up past the windows, brilliant. The return journey was back down the Arterial in the London direction, turning left back down the High Road and with me getting off near Sizers butchers. Early school friends in 1957 were Brian Archer (known as Archie) who lived in the bungalow Condon and Andy Darroch who lived in the Variety Stores. There was also Philip Trew from the King Edward Estate. We were all in Mr Stone’s class. 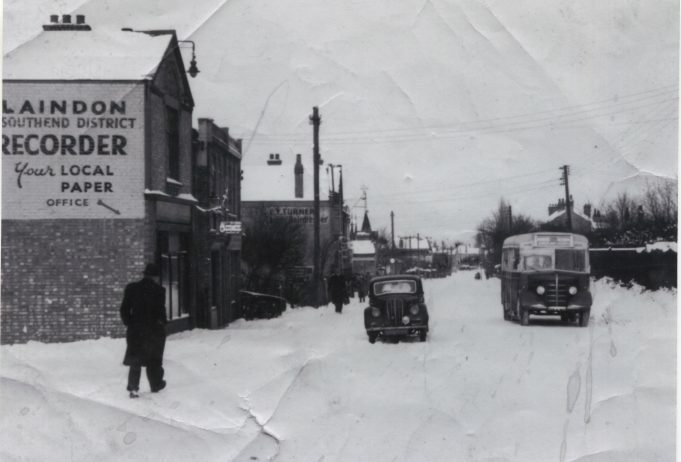 The picture of the bus in the snow could have been taken in early 1947 which I am told was the coldest winter for years. The next coldest was 62/63 which I do remember in Laindon, it was freezing from December till March. My favourite of the above photos is the 1936 one at Laindon Station, clearly a summer’s day in a world so different from now. As Richard says: Station Approach in a time so different from today. After a hard day’s train spotting and standing on the footbridge, to get a soaking from the steam rising from the trains passing below, what better than going into the little cafe along there. A Jubbly, chilled or frozen solid, what a treat. A frozen one could last for an absolute age, and the last bit would have thawed, now you had a drink as well. Magic. According to their timetable of that year, in 1938 City Coaches Company Ltd of Brentwood was operating the following bus services in the Laindon area. Service Number 3: Laindon to Billericay and Return via Little Burstead. From Laindon, the first bus on this service left Laindon Station at 7.30am followed by the next at 9.15am and thence every 15 minutes past each hour until 10.15pm with the last bus departing at 10.45pm.This service seems to have applied every day except that on Sundays there was no service at 7.30am, 9.15am or 10.45pm from Laindon. From Billericay, the first bus was at 7.5am, the next at 8.0am then at 1015am thence at 45 minutes past each hour until 9.45 pm but with a last departure at 10.25pm. Here again, this same service applied each week day but on Saturday afternoons after 2.45pm the buses on this route left Billericay at 25 minutes past each hour until 10.25pm. The first service on Sundays was not until 9.45am but continued hourly at 45 minutes past each hour until 2.45pm when the interval changed to 3.25pm and thence every 25 minutes past each hour until the last service at 09.25pm. Service Number 4; Laindon to Brentwood and Return via Dunton. This particular route which also started from Laindon Station Approach Road was not the best way of reaching Brentwood from Laindon because the service followed a somewhat circuitous route to reach its destination. In fact, the detail as published in the Laindon area while giving departure times from Laindon gave no clues regarding return times from Brentwood. To reach Brentwood from Laindon most people would travel to Billericay and transfer, usually at Sun corner, to the service that was operated from Southend via Wickford along the Southend/London Road by, I think, Westcliff Motors. The No.4 City service which left from Laindon Station at varying departure times at approximately hourly intervals from 08.00am until 10.20pm Mondays to Saturdays (they started at 11.15 am on Sundays) was routed to run via Dunton Road to Wayletts then via Lower Dunton Road as far as Doesgate Farm Lane where it turned right and ran on to link with the Tilbury/Brentwood Road before turning left into Bulphan Village. 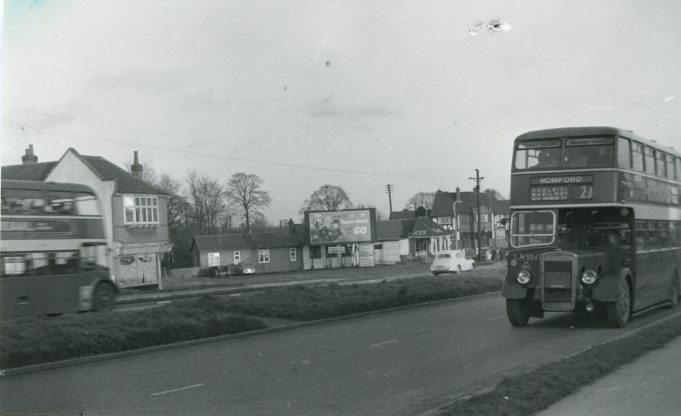 In Bulphan the bus was reversed before returning back to the Tilbury/Brentwood road again and going forward to East Horndon passing the “Halfway House” on the Southend Arterial Road. Continuing forward towards Brentwood it first made a detour at Herongate as far as “The Old Dog” on the Billericay road. At “The Old Dog” it was again reversed before returning to Herongate Village and picking up the route again via Ingrave to Brentwood. Although the impression given on the timetable at Laindon would suggest that Brentwood was the end of the route, a separate diagram shows that, in fact, the service was extended as far as Chipping Ongar serving a number of divergent villages in between and often following a completely different return route on return from that taken on the “outward” journey. The return times from Brentwood to Laindon station were not made available on Laindon’s timetable, only the times of departure from Bulphan village. Service Number 5; Laindon to Billericay and Return via Great Burstead. From Laindon, this service started from the station yard at 6.25am,7.50am,8.30am,9.45am, 11.45am, 2 0pm, 4.22pm, 5.58pm, 6.56pm, 7.45pm,8.45pm, 9.45pm and 10.45pm on Mondays through to Fridays. On Saturdays the programme was the same until 2.0pm after which buses only ran at 3.45pm, 6.10pm 8.10pm and 9.55pm. From Billericay, the first service on Mondays to Fridays was at 06.00am, then at 7.00am, 8.18am, 10.18am, 12.18pm, 2.18pm, 4.50pm, 6.18pm, 8.18pm, 9.18pm and 10.18pm. On Saturdays the service started at 6.45am then at 8.10am, 10.05am, 12.05pm, 2.20pm,4.05pm, 6.30pm, 8.30pm finishing at 10.05pm. On Sundays only six services operated namely at 2.20pm, 4.5pm, 6.30pm, 8.30pm, 10.15pm and 11.15pm. Both this service and that of Number 3, as I recall, reversed in Billericay High Street for their return journeys by backing into Chapel Street, a move that would be rather unpopular these days! Service No 6: Laindon Circular. This was the service the origins of which went back to the earliest provision of omnibus services in the Laindon area. It had been designed to link the furthest reaches of the parish with its railway station which had been erected beyond the district’s southernmost boundary. The reach of the ‘bus service was restricted from the outset by the suitability of the roads over which it operated to withstand regular traffic. These confined its route to, starting from the Station’s forecourt , running the full length of Laindon High Road as far as the “old Fortune of War”, thence the full length of Wash Road to the junction with Harding’s Elms Road and Pipps Hill where a right turn extended the route southwards and forward to link with Basildon Road. A right turn into Basildon Road back towards Laindon meant that the bus service arrived back in the parish adjacent to “Donaldson’s” school at Laindon Park where a right turn into Church Road meant that the service returned to Wash Road adjacent to the “Prince of Wales” where a left turn took the passenger back to the outward route via Laindon High Road and a return to the station forecourt. The average journey time for this circuit was 30 minutes. 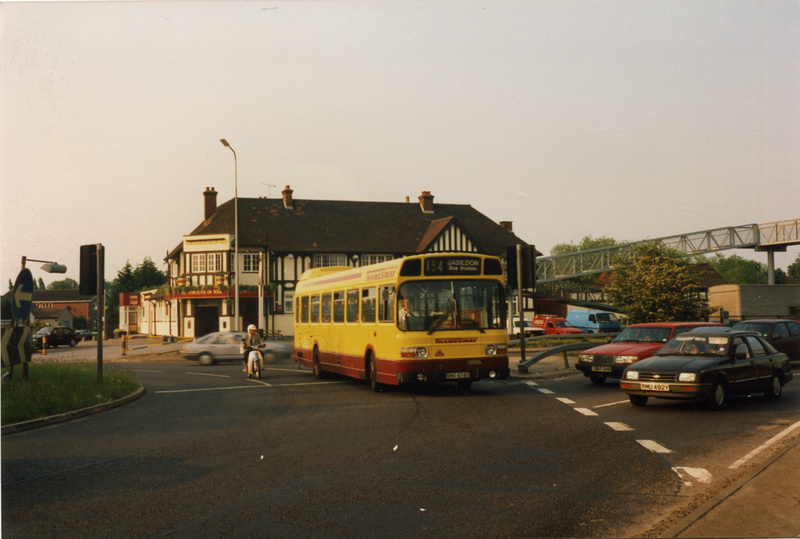 In general, the service was operated at approximately 30 minute intervals throughout the day, although at “peak” times services were often duplicated with a bus leaving the station and following the route described above followed shortly afterwards by a second service following as far as the “Prince of Wales” but then turning right into Church Road to follow the route in the opposite direction to the first ‘bus. At times throughout the day the full circuit was truncated either by not running the full length of Wash Road/Basildon Road and turning instead at the south end of Church Road or, on an even shorter run still, turning at the “Old Fortune”. These services operated from 5.32am in the morning until 11.55pm in the evening on each day from Monday to Saturday. On Sundays the service started at 08.10am and finished at 11.23pm. In total on each day Monday to Friday a total of 38 services were operated on the pattern detailed above. On Saturdays the service was increased to 50 round trips. On Sundays 39 round trips were completed. Service Number 8;Laindon to Romford and return. This was a service devised to operate on a Wednesday only, Wednesdays being Market day in Romford. Only one bus operated the service which started from the carpark of the Laindon Hotel at 10.0am running via Laindon High Road to the Old Fortune, thence via Dunton Road to Wayletts, Lower Dunton Road to Does Gate Lane, Does Gate Lane to Bulphan Church which it left at 1020 arriving at Romford at 10.55am. The return from Romford was timed as 2.30pm arriving back at Bulphan Church at 3.05pm, at Dunton at3.15 and Laindon Hotel at 3.25pm. Service Number 9; Laindon to Wickford and return. This was also a “market run”. Running on Mondays only, there were three services; at 10.03am, 10.30am and 1.45pm from the carpark at the Laindon Hotel. 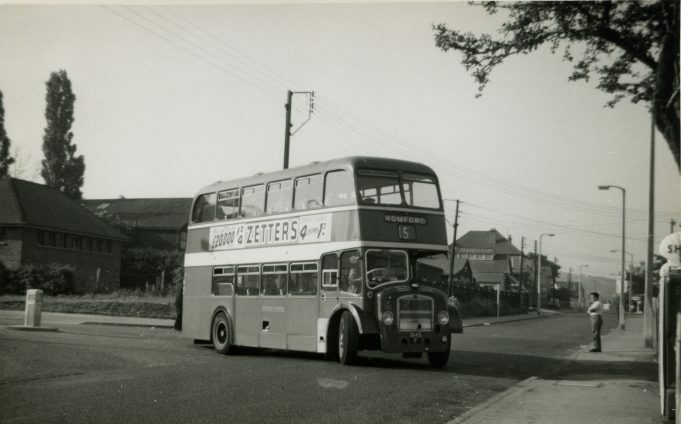 Each ‘bus ran via Laindon High Road to Wash Road and thence to the Basildon Road. It is not clear if it reached the Basildon Road via Church Road or via Wash Road and Pipps Hill. From the Basildon Road it continued on into Rectory Road, Basildon to link up with the Nevendon Road just south of “The Cricketers” before running on into Wickford arriving at 10.35am.11.05am and 2.20pm respectively. Return from Wickford was at 12.00 midday, 1.00pm and 2.30pm respectively arriving back at the Laindon Hotel at 12.35pm, 1.35pm and 3.05pm. Service Number 10; Laindon to London (Mansell Street) and Return. This was a service that was operated only on a Sunday and was clearly devised to take advantage of the fact that the first train from Laindon to Fenchurch Street did not leave until 08.19am on Sunday mornings. The coach left Laindon Station forecourt at 6.15am arriving in Mansell Street at 7.30am departing on the return journey 15 minutes later at 7.45am reaching Laindon Station again at 9.0am. This was clearly an advantage for early morning travellers, the first “down” train not arriving at Landon until 9.46am. The first train, in any case, always commenced from Plaistow and not from Fenchurch Street. Mansell Street was, presumably, chosen as the terminating point because of its proximity to Fenchurch Street while not being within the broad limits of the City which might have necessitated special permission for omnibus operation at that time. It is not clear by which particular route to London the coach took but it most probably followed the A127/A12 route as being the speedier way to reach its destination in the time allowed. Westcliff-on-Sea Motor Services Limited: This company ran an hourly service commencing at 5.15 am from Southend to Romford serving, on the way, Hadleigh, Benfleet (“The Tar Pot”), Pitsea High Road, Laindon (“The Fortune of War”), East Horndon station or the Alma Factory in Great Warley meant Laindon was provided with a departure to Romford at the FoW at fifteen minutes past each hour from 6.15 am until 9.15pm. 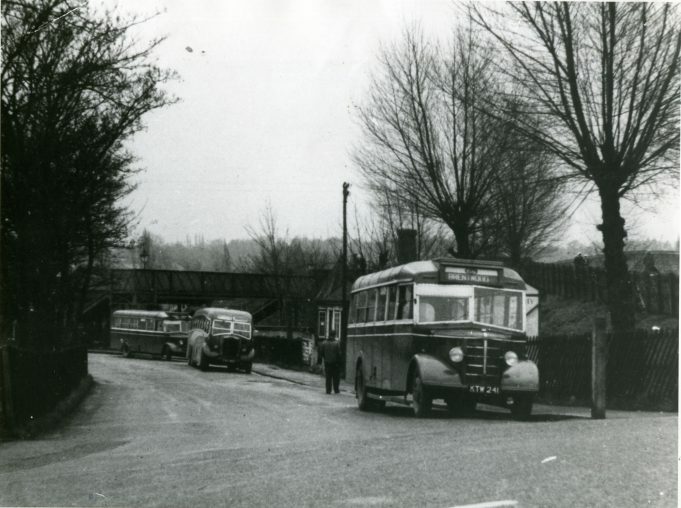 (On Sundays, the service did not commence until 09.15am) The services that diverted via Great Warley Street (those at 6.15am, 7.15am, 10.15am, 2.15pm and 6.15pm from the FoW) were intended to get workers to the CWS Shirt and Milk Equipment factory. This works had been deliberately constructed in a rural setting following a general revulsion about the poor social environment that accompanied much heavy industry in the UK. Unfortunately not enough thought had been given to accessibility and this problem, in time, resulted in the factory taking on a totally different role. No doubt at the time of the work’s first inception, hopes were still high that the District Line which had been extended as far as Upminster would be extended further and supply an easy means of access. These hopes were dashed by the outbreak of WW2. 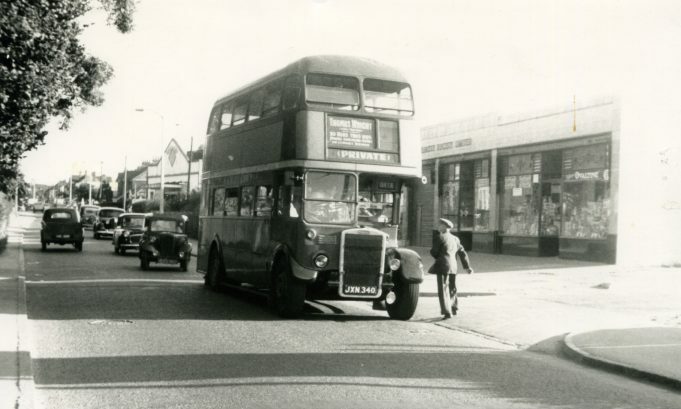 In 1938 the bus service on this route running hourly from Romford to Southend was maintained from 6.38 am from Laindon until 11.03pm the last bus from Romford departing at 10.25pm. 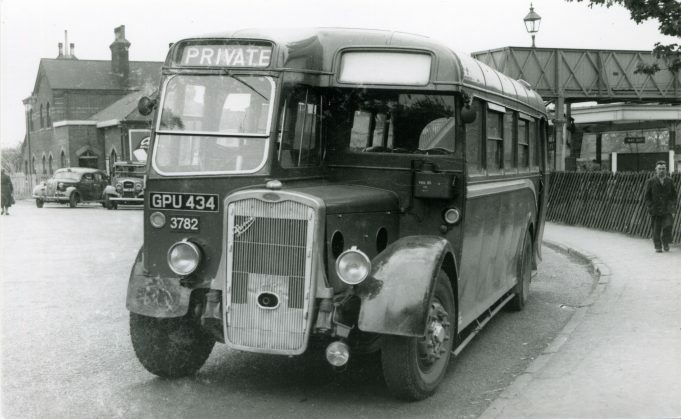 The Eastern National Omnibus Company: This bus company ran a service based on Chelmsford where its Head Office was located. The service was extended to run, on an hourly basis, between Harwich and/or Clacton in the North East of the County of Essex and Tilbury Riverside in South Essex. This extensive route had arisen basically to provide an interchange between the two ports of Tilbury and Harwich to cater for the needs of the river pilots who worked often between the Thames and the Orwell rivers. From Laindon’s viewpoint the timetable provided a service from 8.18am, thence at 33 minutes past each hour after until 10.33pm to reach Tilbury running via Horndon-on-the-Hill, Orsett and Grays. Alternatively, the same service ran at 09.22am and hourly at 22 minutes past each hour to Chelmsford until the last bus departed at 11.22 pm. From the point of view of the ‘bus company, the focal point of Laindon was considered to be the Laindon Hotel. The route taken to reach Chelmsford was via Billericay, Stock and Galleywood. Service times were not advertised beyond Chelmsford but the fact that fares to Colchester (5/-) and Clacton (6/6d) were with a guarantee of a forward connection is significant. Frequently, such a forward journey involved remaining in the same vehicle throughout. I Loved the ones showing Laindon Station and how I remember it. Thank you for letting me see them. Brilliant photographs Ann and John; thanks for sharing them with everyone. Later ones brought back some memories of places now gone – also days when we had no car and often used the buses. Great ‘back in time’ moments.